These two have been together for nine years, engaged for four years; they’ve lived together and far apart, separated by jobs or school. They’ve lived in the northwest, the southeast, overseas. Their wedding was threatened by a not so distant wildfire. Mazama was on a level 1 alert which means, be ready, in case this fire blows up and moves closer to homes. Their home in Florida was threatened by Hurricane Irma. And yet, it all turned out. The fire cooperated and photos were made high in the mountains and the intimate morning wedding in Mazama went just as planned. Irma changed course. Sometimes it all works out. They had considered having the entire event high in the mountains near Harts Pass however some family members were reluctant to drive the steep and windy road to the top. And with the potential fire danger, it was even scarier. Instead, they had it on the edge of a meadow at Mazama. Just the three of us drove to Harts Pass to catch the morning light and the beginning of fall colors in the alpine larch trees. Just yesterday, Harts Pass was closed to the public due to the continuing wildfire situation and Mazama is on Level 2 notice. Since this was a morning wedding, we started early. The hair and makeup artist was there at 4:30 AM! I started working at 6. Have I mentioned that all weddings are unique? It’s true. That is something I love about them. My website, Reflected Light Images continues to be a problem for me to fully update. Hopefully, this will be the last of my weddings to be posted here. Yesterday the girls and I joined with Molly (remember Molly from last year?) and Mary for a nice hike, mostly above tree line in the North Cascades. We drove through a layer of wildfire smoke to get to the trailhead and found perfect blue skies with fluffy clouds. 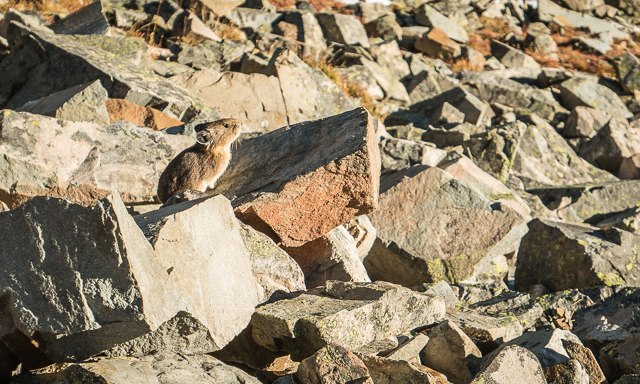 Ground squirrels and hoary marmots and pikas gave their warning calls as we walked by. At the end of the hike we could see the smoke column from the Diamond Creek wildfire east of us. In the meantime we were treated to vast vistas of mountains in all directions. We all felt grateful to have this in our ‘backyard’. The dogs were most grateful for the last of the snow and a creek of snow melt leading to a clear refreshing pond for cooling off. Look! All five of us looking at the camera! Ok. So Luna wasn’t exactly looking at the camera, but almost. The girls and I have not been getting out enough lately. Both of them are still in bed, not even asking to go outside or have breakfast. That is nearly unheard of around here. We had a lovely outing to Slate Peak yesterday but I didn’t think it was overly strenuous. Must have been all that fresh mountain air and the cold streams. I was told that the road to Harts Pass was open although not all the way to the trailhead near Meadows or to the lookout parking lot. Sure enough, that was the case. Several cars were parked at the last PCT trailhead with lots of hikers and walkers heading north on the well-worn path. Luna and Sky and I simply walked over the snowbanks and up the road to the lookout. It’s only a mile and a half walk and we had it all to ourselves. The flowers were amazing and the mountain views were beyond beautiful. Later we walked near Meadows and saw more wildflowers and clear mountain streams.